Ricky Martin, I heart you. In fifth grade, I was sitting in Mr. P's classroom, which happened to be a portable because my South Florida school was well beyond capacity. I sat on the far right side of the room next to a large bookshelf where we kept a stereo. Some afternoons, if we were simply working on individual work, Mr. P would turn on the radio. This is about the time Ricky Martin's Living la Vida Loca first made its way to the American airwaves. We sat listening to his Latin heartthrob lyrics when suddenly: "...she'll make you take your clothes off and go dancin' in the rain, she'll make you go innnssannneee..."
Before any of us could register these scandalous lyrics, Mr. P ran to the stereo and quickly turned it to a classical radio station. That was it. No more Ricky Martin. From that day forward we never again listened to the Top 40 station, it was classical all the way. What is it with the teen heartthrobs of my youth coming to play a concert in Lima? The Backstreet Boys came in May, which brought me back to the days of my Sony Discman and tanning by my pool in Florida. And now Ricky Martin. I hope that Hanson and 98 Degrees is next. Then all my girl hood dreams will come true. And that, ladies and gentlemen, is what I remember from fifth grade. Besides the science experiment making circuits out of aluminum foil and having to swish with fluoride once a week, that's all I've got. Peruvians are proud of their Peruvian food, really proud. There is a pride that radiates from a person when they begin to talk about their favorite Peruvian dishes. It's an interesting moment to watch, especially for me, since the culinary specialities from the States are generally an Americanized version of some other country's specialty. Though Southerners love their comfort food and their bar-b-que. And be warned, never mess with a Southerner and their sweet tea. Yesterday was Ceviche Day. A national celebration of the deliciousness that is raw fish "cooked" in lime juice. Don't let the raw fish line send you away, it's amazing. Absolutely amazing. I'm told that some foreigners don't like ceviche because of the raw fish issue. Well, I love it. Does that add a few more points to my wannabe Peruvian status? Let's hear it, three cheers to all the fish who give their lives for such a culinary treat. 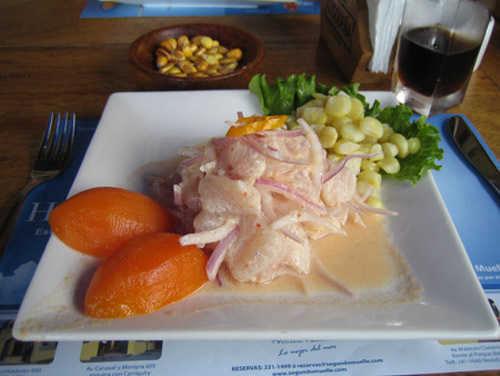 Happy Ceviche Day, Peru! Next up on the food celebration list is Pisco Day at the end of July. I can hardly wait. If you're making your way to Lima anytime soon, here's Living in Peru's list of the top ten ceviche restaurants in Lima: be sure to check them out. When we were in the United States a few weeks ago, someone actually congratulated us on surviving traffic in Lima. I accepted the congratulations with great sincerity because surviving traffic in Lima is no easy feat. I come from a land full of kind, orderly, overly sympathetic Southern drivers. If you need to get over to another lane, simply put on your blinker and a kind driver will welcome you in front of them with a warm wave. Once you find your place in the lane, a small thank you wave is exchanged and there is harmony in the world. If the traffic lights are not working, the intersection becomes a four way stop and drivers patiently wait their turn in line. As I wait my turn I usually think, "Look at how nice humans can be to one another." And then in Lima, simply driving down the street is an exercise in survival of the fittest. This no holding back, let the biggest car win approach to driving has completely dissolved my desire to drive in Lima. My boyfriend's mom tells me, "...but you know how to drive, you will be fine." Not exactly. I know how to drive in a state of orderly drivers who respect traffic lanes. I know how to drive in a city with traffic laws that are actually laws and not mere suggestions. I know how to drive in a place where a stop sign means stop, not honk-your-horn-as-you-pass-through-the-intersection-to-tell-the-other-cars-that-you-are-coming. Lima is the only city I have ever been in where cars in the right hand turn lane, dart forward after the light changes, go across several lanes of traffic and make a left turn. He with the larger car wins. Today, I received this video as yet another shocking example of the traffic conditions in Lima. I know that the traffic problems and lack of law enforcement are serious issues, but I can't help but to sit in humored awe as I witness the chaos. It's something that to me, a driver from regulated, kind Tennessee, is so bizarre that it can't possibly be real. Now you too can witness the adventure that is driving in the city. You don't need to speak Spanish to understand the video, but I'll give you a hint: that's an exit ramp. This morning while driving to work, one of my Peruvian friends began telling me about two stories she heard on the news last night. She shared with me a report about the bleak conditions present in Lima´s firestations. The reporter explained that in most cases, though each station has several fire trucks, at any given time only a couple are operational. Being a firefighter in Lima is not a paid position, so all men and women are volunteers and the stations recieve little if any funding from the government. I have yet to see a a firestation during my time Lima. If one of the city´s high rise apartment buildings were to catch on fire, what could be done? The following story she shared with me was a feature on the frigidly cold weather conditions in Puno, Peru. This area is underdeveloped and poverty stricken. Due to the lack of resources, often time residents become very ill due to the cold. She told me that the Regional President of Puno spoke on the news and said, "They keep telling me that money is coming, but I haven´t seen it yet. I have been here for five months and I haven´t seen any of it." As I learn more and more about the complicated workings of the Peruvian government and social programs, I am overhwlemed by the sheer volume of obstacles facing anyone who would like to make a positive change. Money, food and blankets are important means of help, but Peru needs more than that. There are problems that are so deepy institutionalized, that it appears to me that it would take decades to change the system. It breaks my heart to see the enormous volume of need in the city around me and yet I don´t know where the help should begin. No matter where you are in the world, there are problems which are staggeringly overwhelming. How do you cope with feeling helpless? There's this adorable American girl in my class, complete with the cutest blonde bob you have ever seen. From my first day in the class, I have felt like we are kindred spirits, solely based on our mutual Americanness. She, of course, speaks to me in English which is helpful in a classroom full of Spanish speaking students. Though I understand all of my students, I think of my American friend as an informant. She can quickly replay the latest fight or argument without a language barrier from either party. During snack time, all the Peruvian students take out what I would consider to be a full fledged lunch. Sandwiches, fruit, yogurt and chips crowd their desks. No wonder these children don't eat their huge school made, Peruvian lunch. Their little tummies have to be stuffed from their oversized snack. The American girl, however, eats more my style. Juice and Chex Mix. Or juice and those delicious, but over processed orange crackers with peanut butter filing. Mm, mmm good. By just looking at her snack you know, "This girl isn't Peruvian." After a recent trip to the States, she came to school everyday with Gushers, Chex Mix, Goldfish and Cheez-its. I thought, "Where is this jackpot of American goods and how can I get there?" I enthusiastically asked her mom where she buys all those little pieces of America and she told me that everything was brought back from their trip. It's the small things that bring you comfort. Like Gushers and Cheez-its. What I adore most are her child-like interpretations of Peruvian culture. Last week she told me, "I don't really like it here because people just throw their trash on the ground. That's bad, they shouldn't do that." I feel like she and I have a unique relationship since together we are exploring this strange language and interesting culture. She's a brave little six year old, speaking Spanish with her friends and struggling through the mistakes. When she is scared and frustrated, she hides behind me in part comforted by our shared cultural heritage. And then I tell her, "It's ok, I'm learning Spanish, too. Let's learn together." "It's sunny." or "It's not sunny." For the first few months that I was here, this exchange caused me endless frustration. Telling me about the amount of sun in the sky does little to inform me about the outside temperature. Oh so I thought. In Nashville, I couldn't leave the house without consulting the weather. During the winter, I needed to know the day's high in order to know how many layers to wear. During the summer, I needed to know if I should expect a cool summer breeze. 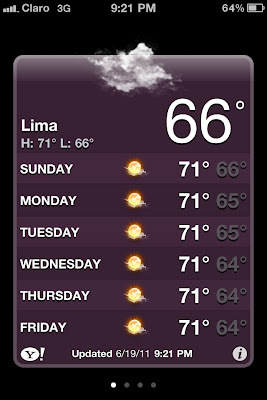 Well, now that we are solidly into Lima's winter, I understand why no one speaks of the weather in temperatures: because it doesn't matter. In the morning when I leave for work, it's usually cloudy and grey. The air has a coolness that cuts through my trench coat. If the sun stays hidden behind the clouds, the weather stays the same for the whole day. On these days my fingers turn to ice and I wear my coat the whole day. I spend most of the day wondering: How can 60 degrees feel so cold? However, if the sun peaks out from behind the clouds, the day warms up and I am transported once again to summer days. Forget about those perfect winter days when the air is crisp but the sun welcomes you to be outside, bundled in your warmest kints. I have unfortunately come to the conclusion that they don't exist here. When the sun is out, it's hot. End of story. I have been working too much. It's as simple as that. Quite by accident, I have been working 70+ hours per week since the middle of April. I went to the United States a couple of weeks ago and the night before my return flight, I broke down in my parent's living room. The thought of returning to Lima and working that much crippled me. After a long conversation with my dad (Happy Father's Day! ), it was very, very clear that I needed to quit one of my jobs. 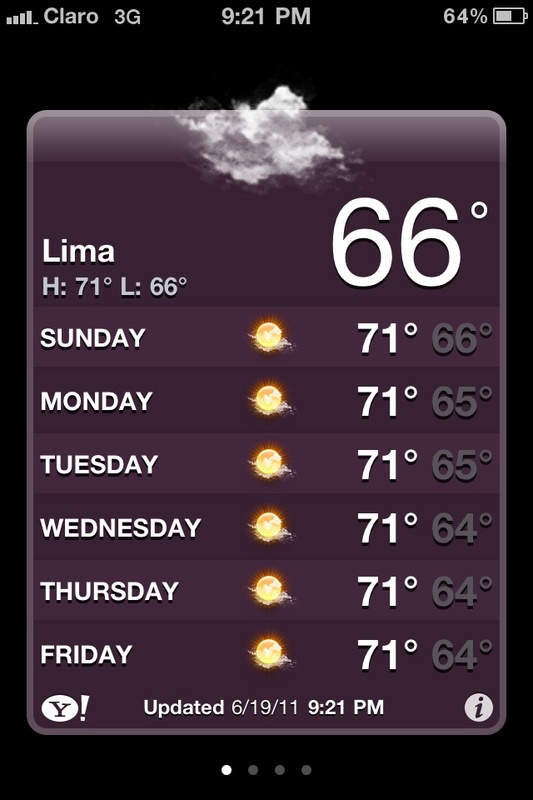 The exhaustion that I feel from working so much prevents me from exploring Lima. The decision was made: I'm quitting. I couldn't feel better about it. Peru requires a 30 day notice when leaving a position (which feels like forever). I am, however, six days into that period. Only 24 to go. 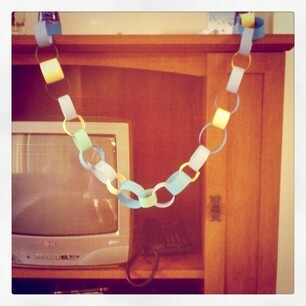 To help me count the days, I have made a paper chain, reminiscent of my days in the second grade, and I take great satisfaction in removing one each evening. Only 24 days until yoga, blogging, reading, cooking, baking, writing and time with Ms. Emmaline. One of the best things about Lima is that you can get nearly anything you want via delivery. Craving McDonalds but don't want to leave your house? No problem, get it delivered. 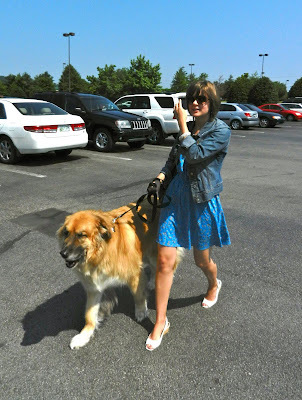 Your pet needs to go to the groomer? No worries, they will come and pick up your pet. You're sick and desperately need medicine but don't have the strength to go to the pharmacy? Your wish has been granted: the pharmacy delivers. Best idea ever. I absolute love the concept of a pharmacy delivery service. So many times in the States I was really sick and unfortunately out of the necessary medication. But the thought of driving to Walgreens was daunting, so I laid on the couch and waited for someone to save the day and bring me medicine. But not in Lima. Just call your local pharmacy, make the request, tell them the amount you will pay with (so you can receive correct change) and just like that- pharmacy delivery! I am convinced that this could be a fabulous business venture in most US cities. My sincere apologies for my extended absence. Two weeks ago, Alvaro and I boarded a plane for my home sweet home in Nashville, Tennessee. We had two weeks of nothing but seeing friends, spending time with my family and eating way too much good food. I took a much needed break from my laptop and enjoyed two weeks of green grass and summer sunshine. And I got to spend lots of time with my favorite buddy: Maxwell Merriweather Jenkins, my parents beloved dog. Ladies and Gentleman, today's the day. Election Day, Part 2 in Peru.